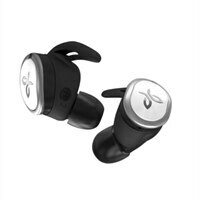 Jaybird RUN True - True wireless earphones with mic - in-ear - Bluetooth - noise isolatingJaybird RUN True wireless sport headphones, completely wireless earbuds, deliver a radically freeing experience to runners. Jaybird RUN brings incredible, customizable sound in a super-small lightweight package, delivering a secure comfort-fit, long-lasting portable battery life with included charging case, sweat-proofing and water-resistance. Free your run with Jaybird RUN - no wires, no worries.